Caroline Thompson (1815-1898). My Father's Father's Father's Mother's Mother. My Great-Great-Great-Grandmother. Caroline is one of the more intriguing characters in my family tree. She was born at Stoke Damerel in Devon, the parish which includes Devonport, a busy area of the city of Plymouth. When we enter her life through the census data of 1841, she is living under her married name Bowles in the Devonport workhouse. At first sight, she is on her own, but elsewhere on the schedule is a three year old girl who is almost certainly her daughter. Ten years later, Caroline is in the Faversham workhouse in Kent with four children. In 1851 she notifies her condition as Married rather than Widow (this question was not asked in 1841, but Caroline already had her married name). A tremendous story has been passed on to me by a Bowles family researcher that Caroline, while pregnant with the child who would go on to be my great-great-grandmother, walked with her infant daughter from Plymouth to Kent to find her husband's family, probably in 1843. There is no sign of her husband in either census. She may have married a William Bowles at Stoke Damerel in Devon in the third quarter of 1837. There is no convincing record of the death of William Bowles in the years after. In any event, she was in the Workhouse without him by the spring of 1841. Is it possible that he had actually gone abroad? Some of the children with her in 1851, including my great-great-grandmother Mary Ann, are under 12 years old - that is to say, they are unlikely to be the children of William Bowles. Indeed, on the birth certificate of at least two of them, the father's given name is Thomas. By 1861, Caroline is living with some of her children and a Thomas Bowles, who is described as her brother-in-law. Again, she notifies her condition as Married. Thomas appears to be William's brother, and was claimed as the father of some of the children, including my great-great-grandmother. It seems unlikely that she ever formally married him. He died in the first quarter of 1870 at Milton in Kent. By 1871 there were no men in the house, and at last she was described as a widow. From 1881 until her death in 1898 she lived as part of the family of her son Charles, who was a brickfield labourer, like so many of my Knott forebears in Kent. Caroline was twenty-five years old at the time of the 1841 census. She was living as a pauper in Devonport Workhouse, Stoke Damerel, Devon. She is listed on her own, but on the following page is listed a three year old girl called Frances Bowles, who reappears under that name with Caroline on the 1861 census, and is thus almost certainly her daughter Angelina Frances, born in Stoke Damerel in the second quarter of 1838. Caroline and Frances are shown as being born in Devon. The transcript for their entry is here. You can view the original census page for Caroline here, while the original census page for Frances is here. 1843: Caroline's second daughter, my great-great-grandmother Mary Ann Bowles was born on the 1st November at the Mall, Preston, Kent. Preston is a suburb of the town of Faversham, and the Mall connects the centre of Faversham with the London to Canterbury road. Her father was given as Thomas Bowls (recorded as Bowles on later census and other data) and her mother as Caroline Bowls formerly Thompson. Caroline's place of residence was given as simply 'Preston'. 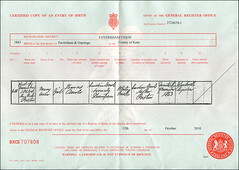 The birth was registered on the 14th November. Caroline's age is recorded as forty-six at the 1851 census (this is wrong - Caroline was thirty-six). She is shown as a pauper in the Faversham Union Workhouse, Faversham, Kent. Caroline reported her condition as Married, but there is no sign of her husband. Unfortunately, the 1851 census institutional forms do not show the relationship of people to each other, and so we can only assume that the children listed with Caroline, sharing her surname, are her children. There are four of them. Angelina was 13 (surely this is the Frances recorded in 1841 - her registered name at birth was Angelina Frances), Deborah was 12 (but she was actually 2) my great-great-grandmother Mary Ann was 8 and Susannah was 6. Curiously, Mary Ann and Susannah are listed before Angelina and Deborah. Could this be because they had different fathers? Caroline is shown as being born at Devonport, Devon, as was Angelina (Frances). Mary Ann, Susannah and Deborah were born in Faversham, Kent. 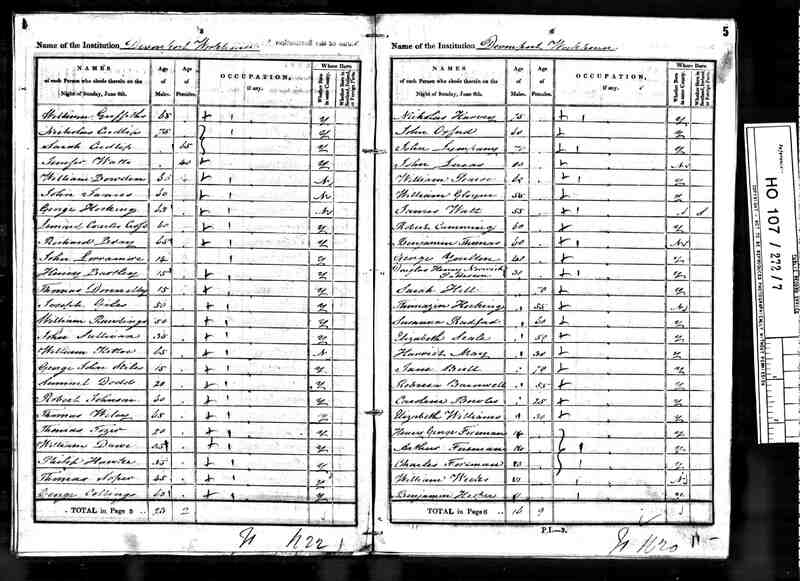 The transcript for their entry is here and you can view the original census page here. Caroline was forty-four years old at the time of the 1861 census. The family were living at Tanner Street, Faversham, Kent. Caroline gives her occupation as dressmaker. She notifies her condition as Married, but a husband is not listed. Caroline had four children at home. Frances is 22 (could this be Angelina Frances, who appeared under her first name in 1851? ), Susannah is 15, Deborah is 13 (confirming that she was 2 in 1851, not 12) and Charles is 8. Frances and Susannah are both described as dressmakers. Also living in the household is Thomas Bowles, aged 40, described as the brother-in-law of Caroline Bowles (could he actually be living as her husband?). Caroline and Frances were born at Stoke Damerel, Devon (this is the correct parish name for Devonport, recorded in 1851). The other children, and the adult Thomas, were all born in Faversham. The transcript for their entry is here. Caroline's daughter Mary Ann, my great-great-grandmother, had left home. She was seventeen years old at the time of the 1861 census. She was living as a servant in the household of her uncle and aunt, Stephen and Mary Hudson, at Pleasant Row, Chatham, Kent. Mary Ann is shown as being born at Faversham, Kent. The transcript for their entry is here. Caroline was fifty-four years old at the time of the 1871 census. The family were living at New Milton, Kent. Caroline notifies her condition as Widow. Caroline had one of her children at home. Charles is 17, and is described rather curiously as a lodger rather than as Caroline's son. Also living in the house was Mary Ann Bowles aged 4, described as a boarder. She may well be Caroline's granddaughter. Caroline was born at Stoke Damerel, Devon. Charles was born in Faversham, Kent, and Mary Ann was born in Milton, Kent. The transcript for their entry is here. Caroline was sixty-six years old at the time of the 1881 census. She was living with her son's family at Oare, Kent. Caroline's son Charles is shown as a brickmaker. He was 27. His wife Harriet was 24. Charles and Harriet had two children. Annie E was 3, and Leah was 7 months. There was also Lizzie Croucher, aged 20 and described as sister of the head of the household (presumably actually Harriet's sister, and therefore sister-in-law). Caroline was born at Stoke Damerel, Devon. Charles was born at Faversham, Kent. Harriet was born at Sittingbourne, Annie E at Preston, Leah at Oare and Lizzie at Milton, all in Kent. The transcript for their entry is here. Caroline was seventy-six years old at the time of the 1891 census. She was living with her son's family at Amos's Cottages, Oare, Kent. This is possibly the same house as in 1891. Caroline's son Charles is shown as a labourer in brickyard. He was 37. His wife Harriet was 34. Charles and Harriet had four children at home. Leah was 10, Frances was 6, Charles was 3 and Caroline was 9 months. Also in the house was Henry Rye, a boarder aged 25 and described as a labourer in brickyard. Caroline was born at Stoke Damerel, Devon. Charles was born at Faversham, Kent, as was Henry Rye. Harriet was born at Sittingbourne, and the children were all born at Oare. The transcript for their entry is here. 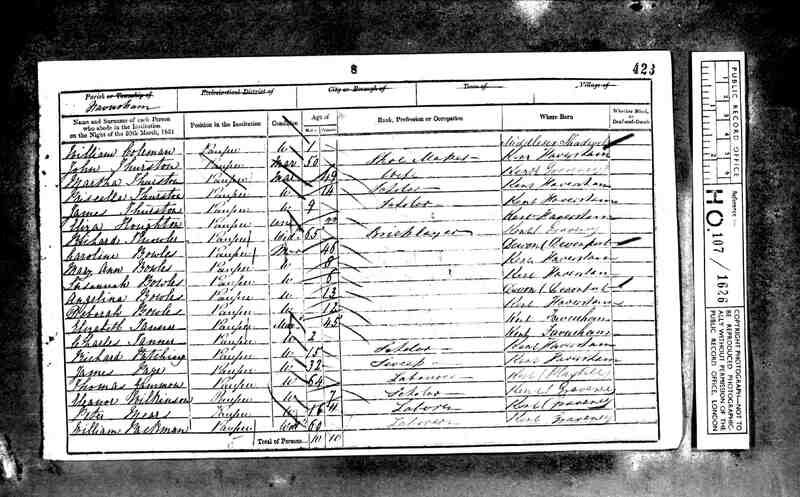 By the time of the 1901 census, Caroline was dead. It is probably her death which is recorded at Sittingbourne in Kent in February 1898. Charles and his family had moved to North Street, Milton-next-Sittingbourne, Kent. Charles is shown as a brickfield labourer. He was 48. His wife Harriet was 45. Charles and Harriet had five children at home. Frances was 16, Charles was 13, Caroline was 11, Alfred was 8 and Thompson was 5. Charles was born at Faversham, Kent. Harriet was born at Sittingbourne. The three older children were all born at Faversham (Oare on previous census, but Oare is very close to Faversham) and the younger two at Milton. The transcript for their entry is here.